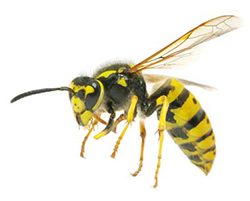 Our treatment for wasps is just to simply to kill the nest and remove it from your eave. The cost for this service varies from how many nests to where they are located. A simple phone call to us and we can give you most of the information over the phone. If you have Yellow Jackets, the ones that nest in the ground, we need to bid these from the field to make sure first that they are Yellow Jackets and not bees and second to determine the size of the hive and what the price will be. There is no charge to come out and inspect for you.